SoundRoots World Music & Global Culture: Scotland Wins Musical "World Cup"
Scotland Wins Musical "World Cup"
Glasgow (Reuters), 31 March 2010 - Scotland has won the 2010 World Cup -- the FIFA Musical World Cup, that is. 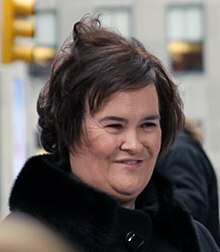 Scottish singer and Youtube darling Susan Boyle edged out some fierce competition and finally defeated Japanese J-pop idol Tomohisa "Yamapi" Yamashita in the final by a thin margin. While more than a few are unhappy with the new competition, FIFA president Sepp Blatter defended it as a key cultural component of the sporting tournament. "Just as in football, music thrives with strong competition," Blatter said. "And just as in football, some won't like the result. If it were a beauty contest, Colombia (represented by singer Shakira) might have won. But Susan Boyle's victory shows that voters were listening more than looking." Unveiled in concert with the 2010 FIFA World Cup in South Africa, the Musical World Cup is something like a global "American Idol" with online voting. As the winner, Boyle will feature prominently on the official World Cup soundtrack CD. In addition to her solo pieces, she will record collaborations with South African artists including Ladysmith Black Mambazo, Amampondo, and Freshly Ground. Boyle was the surprise winner, beating out Brazil (represented by CeU), Germany (17 Hippies), Spain (Buika), Italy (Fiamma Fumana), the United States (Miley Cyrus), and the rest of the 32 singers in the final round. While some observers say a suspiciously high number of votes originated from high-tech hub of Perth, Scotland, FIFA says there was no indication of voting fraud, just the expected outpouring of support from the fans of various nations. OMG! I can't believe how you had me going with this. LOL!